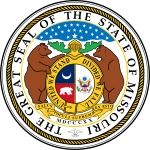 The 2004 Missouri gubernatorial election took place on November 2, 2004 for the post of Governor of Missouri. The Republican nominee, Missouri Secretary of State Matt Blunt, defeated Democratic State Auditor Claire McCaskill. This gave the Republican Party control of both the governorship and the Missouri General Assembly for the first time in 80 years. McCaskill had earlier defeated incumbent Governor Bob Holden in the Democratic primary. This was the first time a sitting Governor of Missouri had been defeated in a primary and the first time any United States governor had lost in a primary since the 1994 elections. Missouri Secretary of State Matt Blunt had token opposition. He easily defeated several lesser known opponents in the Republican primary. Bob Holden had a difficult term as Missouri governor, starting at his inauguration on January 8, 2001, which cost $1 million, and which he struggled to pay for. The state economy suffered a downturn forcing him to make budget cuts and the Republican party gained control of the State Senate for the first time in 50 years. Holden was nicknamed by his opponents as "One Term Bob". Holden announced that he would run for re-election in March 2003, blaming the Republican party for many of the problems during his term as governor. However, Holden was challenged by State Auditor Claire McCaskill for the Democratic nomination, who said that she would be a stronger candidate in the General election against Blunt. McCaskill attacked Holden for delays in education funding, the state's deteriorating roads and increases in tuition fees at Missouri's universities. Holden sought to defend his term in office and attacked McCaskill for the people she accepted campaign contributions from. McCaskill picked up most newspaper endorsements during the primary and won the primary on August 3 against Holden. After the primaries finished Holden and McCaskill met to unite the Democratic party for the general election for what was always seen as being a close race against Blunt. The first of two debates between Blunt and McCaskill was held on 18 October where McCaskill compared her experience to Blunt's inexperience; while Blunt said that McCaskill would not support the Marriage protection amendment to the State Constitution. In the two debates Blunt described himself as bringing change to Missouri and was assisted by President George W. Bush during the campaign. McCaskill kept her distance from Democratic Presidential candidate John Kerry due to Bush's lead in Missouri. In the end Blunt narrowly defeated McCaskill with surveys showing his conservative stance on social issues and the strong showing of President Bush in Missouri helped him to victory. Blunt obtained strong leads in the rural parts of the state which was sufficient to overcome McCaskill's leads in St. Louis and Jackson County. Blunt thus became Missouri's second youngest governor. ^ "The Midwest". The Washington Post. 2004-11-04. Retrieved 2008-02-24. ^ a b "Blunt wins Missouri governor's race". USA Today. 2004-11-03. Retrieved 2008-02-24. ^ a b "After ousting embattled Mo. governor in Dem. primary, state auditor reaches out to him". USA Today. 2004-08-04. Retrieved 2008-02-25. ^ "Missouri voters approve gay marriage ban". msnbc.com. 2004-08-04. Retrieved 2008-02-25. ^ "Holden to seek re-election". The Hannibal Courier-Post. 2003-03-10. Archived from the original on February 23, 2005. Retrieved 2008-02-25. ^ Giroux, Gregory L. (2004-08-04). "Missouri Governor Ousted in Primary". The New York Times. Retrieved 2008-02-25. ^ "Democrats Mend Fences; Blunt Rallies GOP Supporters". The New York Times. 2004-08-04. Archived from the original on 2011-07-19. Retrieved 2008-02-25. ^ "Poll Shows Tight Primary Race For Mo. Governor". KMBC-TV. 2004-07-20. Archived from the original on 2011-07-19. Retrieved 2008-02-25. ^ "Blunt, McCaskill Debate In KC". KMBC-TV. 2004-10-18. Archived from the original on 2011-07-19. Retrieved 2008-02-25. ^ Slevin, Peter (2004-10-24). "Age May Be Trump Card in Governor's Race". The Washington Post. Retrieved 2008-02-25. ^ "Missouri". The New York Times. 2004-11-04. Retrieved 2008-02-25. This page was last edited on 6 April 2019, at 19:27 (UTC).